Is robotic dispensing right for you? Many of our customers are automating applications that are currently being done by hand, or looking to fill large orders and ramp up quickly. Dispensing, like most things in life, offers many options for you to choose from. We suggest contacting IDS directly and discussing your application with an IDS service representative to best decide what equipment is right for your application. Below you will find the two smallest bench top sizes we offer. 5552201N-PKG (below) includes the 5552201N 200MM Economy Robot, pneumatic syringe controller that works with 30cc or 55cc pneumatic syringes, the teach pendant, IO cable, Syringe mount. Requires 1 regulated compressed air line, up to 100psi, each to function. 115V or 230V power supply. Intended for entry level dispensing. The 300MM Stepper is our most popular industrial robot with a dispensing area of 11.81" x 11.81" (300MM X 300MM). 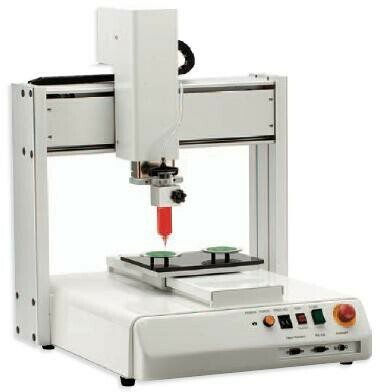 The 300MM Cartesian robot represents a substantial cost saving in comparison to similar desktop robots. 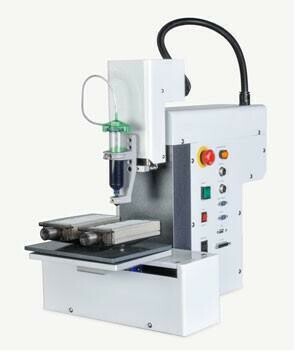 Its overall footprint has a depth of less than 26 inches (640MM), suitable for an industrial bench. This line of robots is also available with a low cost vision system. These benchtop industrial robots are ideal for automating a current dispensing application. With the various work areas offered almost every application can be fitted on one of the models in this series; 200, 300 or 400MM Robots. 4th axis available on this unit. CLICK HERE. Work Load: Table/Tool: 10 kg./5 kg. Includes the 5552202N - 300MM Economy Robot, pneumatic syringe controller that works with 30cc or 55cc pneumatic syringes, the teach pendant, IO cable, Syringe mount. Requires 1 regulated compressed air line, up to 100psi, each to function. 115V or 230V power supply. Intended for entry level dispensing. If this is a new application, or you have never used a system like this before we suggest contacting IDS directly to discuss your options.